Gout is a painful condition that many people experience and you might not be aware that it is actually a type of arthritis. When it occurs, the attack could result in stiffness, burning pain and swelling in the joint. It may affect any joint in the body, but more than likely, it is going to affect the joint of the big toe. This type of condition may continue to occur repeatedly and it is not only uncomfortable, it could result in damage to the joints and tissues in the area. There are a number of causes of gout, but the primary reason why people experience it is because there is too much uric acid found in the blood. Uric acid may not be a horrible problem, and many people who have high uric acid levels do not suffer from this condition. When they are too high, however, crystals may form in the joints, leading to these uncomfortable symptoms. Most medical treatments will focus on providing prescription drugs that are thought to lower uric acid in the blood stream. These prescription medications may or may not help with the symptoms and they might come with some difficult side effects of their own. That is why many people look for a natural gout treatment, and there are a number available. 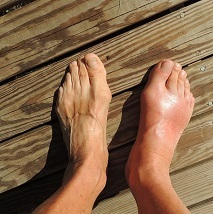 Before we discuss some of the specific natural treatments for gout, it is important to consider lifestyle choices. There are certain conditions that would put you at their risk for this condition, including obesity, alcohol abuse, taking certain medications (including diuretics) or consuming too much meat. Modifying your lifestyle to include healthy food choices, losing weight and avoiding alcohol and meat may help to control the problem on its own. You should never stop using drugs without the consent of your physician, but changing your lifestyle may also reduce your need for them naturally. The following are some of the top natural gout remedies. These may help to treat the problem at its source and get rid of it once and for all. Apple cider vinegar – When it comes to natural remedies for many health issues, Apple cider vinegar is going to be near the top of the list. Taking apple cider vinegar can help with the pain you are experiencing and if you add some honey to the mix, it may reduce inflammation as well. Baking soda – If you would like to decrease your uric acid quickly and naturally, you may be able to do so by using baking soda. Mix 1/2 teaspoon in a glass of water and drink it four times a day. Ginger – The anti-inflammatory properties of ginger root may help to relieve both pain and inflammation. You can add ginger into a variety of recipes or make it into a tea. Some people find that putting ginger paste on the affected area works wonders. Lemon – Squeezing some fresh lemon juice into a glass of water daily can help balance the pH in the body and neutralize uric acid. Epsom Salt – Try soaking in a bath with 2 cups of Epsom salt added. This is not only a great way to reduce the pain of gout, is quite relaxing as well. Cherries – The antioxidant properties of cherries can reduce inflammation and the flareup associated with gout. You can eat up to 20 cherries daily and they are best if you start eating them first thing in the morning. These are only some of the many different options available for treating gout naturally. When you find one that works for you, you will find a solution that can last for a lifetime.